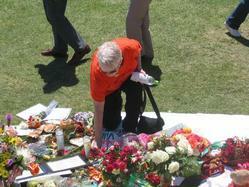 People brought handmade gifts and flowers to the drillfield memorial site to mourn and pray for the victims every day. A student mourned for the victims in front of the Hokie stone memorial site of the drillfield one week after the shooting. A memorial site for one of the victims whose name is Daniel Perez Cueva,around the Hokie stone on the drillfield. After the shooting,people volunteered to come to campus and placed flowers and gifts around the Hokie stone memorial site to remember the victims.